GPU Caps Viewer 1.40.0.0 Portable » TopFreeSoft.Net - Best Freeware Software! 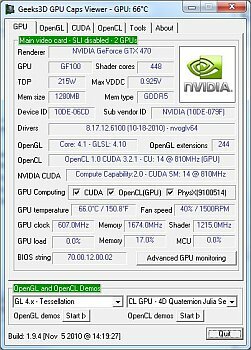 GPU Caps Viewer is an OpenGL graphics card utility for Windows XP and Vista/7. This tool offers the following features: quick view of the graphics configuration (graphics card / GPU type, amount of video memory, drivers version); display of the main OpenGL capabilities (OpenGL version, texture size, number of texture units, etc. ); display of OpenCL API support and extensions; display of the OpenGL extensions supported by your graphics card or display of all existing OpenGL extensions no matter what graphics card you have. For each extension, you can open its description webpage available at the OpenGL Extension Registry or at NVIDIA's OpenGL Extensions spec. Very handy for graphics developers! Display of NVIDIA CUDA level support. Display of the system configuration: CPU type and speed, amount of systeme memory, operating system, PhysX version. Display of the GPU core temperature. GPU Burner or Stability Test: allows to overheat the GPU in order to test the graphics card stability. You can start several stress test demos in the same time in order to make your graphics card working to the maximum. List of links related to your graphics card: graphics drivers and graphics cards reviews. These links are regularly updated. Full report in text and XML format. This kind of report is useful for developers who needs an outline of the customer graphics system (for support purposes for example).